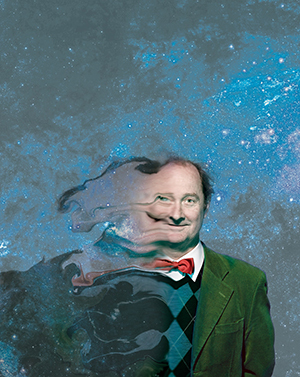 Vere (Faith) is a new play by John Doyle about a physicist at the peak of his career who is presented with a shattering prognosis. The tensions between believers and non-believers are explored as Vere turns not towards God, but to his own sense of wonder at the universe. In the introductory scene we meet Vere, the head of physics in a university, who is bidding students farewell as he prepares to take up a prestigious post in Cern. Vere will be working on the Large Hadron Collider, the world’s largest and most powerful particle accelerator, and aims to prove the existence of the Higgs boson. Vere is on the cusp of a scientific breakthrough that will reveal unknown aspects of the universe. His game-changing mission has attracted accolades from students and colleagues alike. But devastating news thwarts his plans, just moments before a spontaneous end of year drinks celebration is initiated by the Vice Chancellor (VC), an ageing dandy who cannot mask his a predilection for young women researchers. Hilarious dialogue ensues as the VC drools over a young PhD candidate and reminisces of past sexual encounters. Vere’s two fellow physics lecturers trade crude science jokes while a gifted post doc revolts all in the room. Bottles of red spark fast paced banter interspersed with moments of stunning intellectual insight. Anyone who has ever worked in a university setting will appreciate the accuracy of the scene, from the dowdy, shared office space and scarcity of comfortable amenities to the excruciating awkwardness provoked by an unannounced visit from the VC. The shabby decor reflects the struggle of many universities to provide their best minds with adequate facilities, a challenge that tertiary institutions increasingly face in Australia today. Vere’s poetic musings and his inspired projections for a new, interdisciplinary course are soliloquies that could only happen on campus. The dialogue is witty and wonderful. Vere is feted by all, despite secretly reeling from the shock of his bad news. Nevertheless, he enthuses infectiously about physics and more, revealing an encyclopedic knowledge that extends to art, history, languages and poetry. As the younger colleagues try to impress the VC, boundaries are crossed and wildly inappropriate comments are made to great affect. Paul Blackwell plays Vere brilliantly, right down to his appalling sense of dress and the wispy strands of hair that float above his bald pate. Matthew Gregan is a wonderfully arrogant and somewhat sleazy VC, and other cast members play their roles convincingly. In the second act, all but Vere are recast as family members and the parents of his grandson’s fiancé. In circumstances that can best be described as shambolic, the rationalist views held by Vere and his family are directly challenged by their soon to be in-laws. The inevitable conflict is made more poignant by the devastating context of Vere’s increasing vulnerability. Yet Vere continues to be inspired by knowledge. His wonder in the world and quest for understanding represent a deep spirituality rather than professional ambition. The harsh reality of Vere’s situation unleashes a torrent of empathy and generosity. As Vere grapples with his own frailty, people around him struggle to accommodate to his demise. Rather than surrendering to the will of God, Vere chooses to continue to feed his enquiring mind. As he says, “… in the end, life is the joy of wonder, and imagination our greatest quality”. Vere (Faith) is presented by Sydney Theatre Company and is now playing at the Drama Theatre, Sydney Opera House, from 6 November to 7 December 2013.